Premier’s 5- by 10-ft. Fibermak fiber-laser cutting machine, from Ermaksan, boasts a 3-kW laser source that the firm has been able to push to 1180 in./min. when cutting 16-gauge mild steel. Premier Tooling and Manufacturing launched operations in 1990 with nine employees in a 5400-sq.-ft. plant. Now its 170,000 sq. ft. of operations, including a 40,000-sq.-ft. die shop, employs 150. The firm is home to 45 stamping presses, to 1500-ton capacity, as well as CNC production-machining centers, weld booths and assembly cells. In 2011 the firm brought in a CNC turret press to react to the upswing in zero-tooling or low-volume fabrication opportunities coming its . But to really attain the process speeds required, outsourcing such work to local CO2-laser-cutting job shops gained favor. Early into its mission to select a laser-cutting machine of its own, Premier’s search team concluded that fiber-laser technology, rather than CO2, fit better into its mix of customers and products. So says industrial engineer Jeremy Kaiser, who notes that its business has drifted a from a customer base requesting high volumes to a more diverse customer base looking for lower volumes. After evaluating several suppliers from which to source its laser-cutting machine, Premier settled on a 5- by 10-ft. Fibermak model from Ermaksan, outfitted with a 3-kW laser source. Included in the deal is CAD/CAM programming software from Lantek that houses built-in process-parameter charts based on workpiece material type and thickness, as well as the ability to automatically generate parts nests. The software also accommodates unique requirements such as film burning and common-line cutting. Almost from the day the machine was brought up to speed by Premier’s production team, it’s been churning out parts for a solid shift five days/week. At that rate, Seemann calculates an efficient return on investment of around 3 yr. 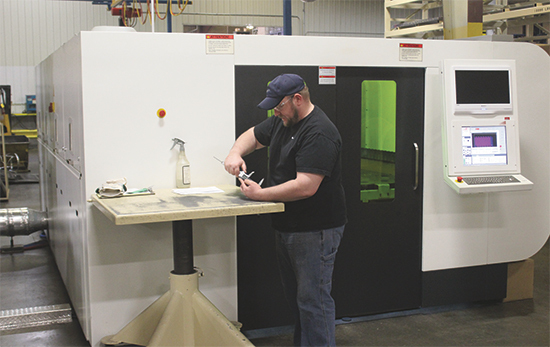 But, he expects that since the laser work has only been, so far, mostly for existing customers, as the firm’s marketing efforts begin to pay off new customers will eventually allow the addition of a second shift of laser cutting. The firm’s competitive advantage also continues to grow as Premier’s staff climbs the learning curve and finds s to squeeze every ounce of productivity from its new machine. Knowing that such a learning curve often can take considerable time to navigate, we were excited to hear of a few notable nuggets of gold the company already has mined as it’s refined its procedures. Kaiser explains. “We’re learning all the time, trying to cut faster than the charts say we should. And, another focus has been on reducing, or even eliminating, pierce times. For example, on one nested sheet of 8-gauge steel that we process often and which contains hundreds of holes, we fine-tuned the laser focal point and the assist-gas pressure and shaved pierce time from 8 sec. down to 3 sec. That alone trimmed 20 min. from the overall cycle time for the job. Continuing his look up the learning curve, Kaiser says the emphasis now has shifted to better-utilizing the Lantek software, more fine-tuning of the process-parameter database, and learning more about using common-line cutting. See also: Ermaksan, Lantek Systems Inc.